Nature changes evolve, transforms in beautiful unique ways. This proves that every creature also changes evolve, transforms in its lifetime. Change is the most constant. Yet there are times when we choose to ignore this valuable universal law. For example, the beauty industry promotes anti-ageing creams. It claims that their products would stop the ageing process. But any rational individual would understand that this claim is false. This is because they’ve based their promise against the universal law of change. The problem happens when we refuse to accept this changing principle. It’s not a bad idea to change. It’s a beautiful aspect of life. We see this in nature. Isn’t it beautiful when a bud blossoms into a flower? Isn’t it beautiful to experience the scent of a fresh flower? In the same way, when we accept the changes in life. When we evolve over time. When we are willing to transform. We blossom. We mature beautifully. The natural process brings out the best in each one of us. Every stage of change is impressive. Every stage of getting evolved is rich and potent. Every transformation is beautiful. Let’s take a very practical example. Add a little bit of curd to a bowl of warm milk. Blend and allow it to sit overnight in a warm place. The next morning what do we see? The milk that was there has now turned into a thick creamy bowl of curd. This transformation happens naturally without us doing anything. The milk turns into curd under the innate intelligence of nature. Resulting in a completely different food with new and unique properties. This practical yet extraordinary transformation is seen in our daily lives. It shows that nature changes evolve, transforms in beautiful unique ways. The natural way of changing, evolving, transforming only benefits us. It refines us if we don’t interfere and allow the process to happen. 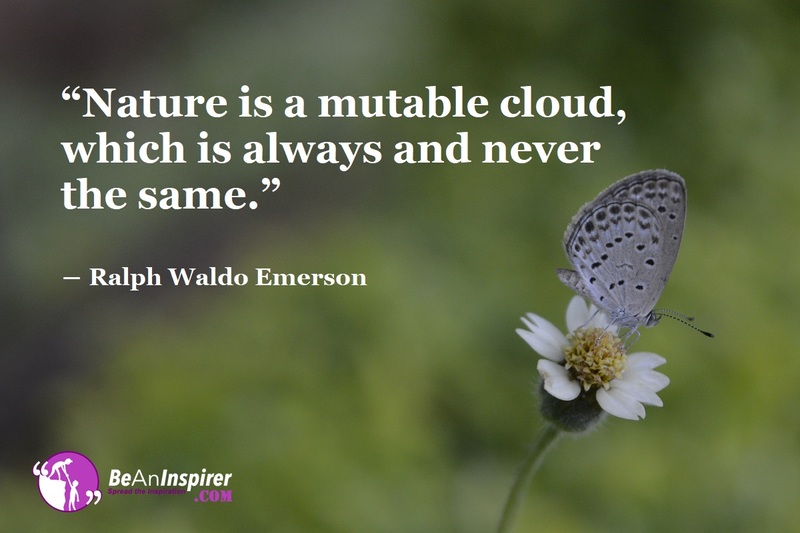 So how has nature affected your life? Do you have stories that you could share? Write your thoughts in the comment section below and inspire others. Wait! Do Not Hurry To Accomplish, In Fact Get The Correct Balance Just Like Our Other Nature Does! Nature Teaches By Setting Valuable Examples. Ready To Learn, Unlearn, Relearn? One Tends To Be What They Are And Achieves Maximum By The Beauty Of Nature. The Virtues And Life Lessons Are Learned From This Unlimited Source Of Inspiration! The Aura of Nature; How We Understand True Nature!